What are some of the creative similarities between acting and being a musician? They’re both different in the sense of what you’re doing and what you’re creating. Both tell stories but one is telling them through music, melody and lyric and the other through dialogue, action and drama. The process is similar in the timing. You might watch a scene in 24 that’s two-and-a-half minutes long, but it could’ve taken us 14 hours to shoot. It’s the same with making a record, where you take some time doing your part but then have to wait for everyone else to finish theirs. It takes time but when you see—or hear—the final product, it makes it all worthwhile. Do you have plans to tour in support of Reckless & Me? We played almost 300 shows for Down in a Hole and I fully expect to do another 200 shows this year. Right now, we’ll be doing a few shows in the U.K. and then we’ll be back for the CMA Fest and 30 to 40 U.S. dates before we go back to Europe for some festivals. Who were some of early musical influences? I had an older brother who was a quintessential music person. Growing up, all he did was listen to his stereo. The first thing he played for me were artists like Elton John and the Beatles, which quickly brought in mid-70s rock like Boston, Aerosmith and AC/DC. As I got older and came into my own I started listening to Bob Seger and Jackson Browne. They had a profound influence on me because their songs told stories. Then I started hanging out with guys who loved outlaw artists like Waylon Jennings, Merle Haggard, Johnny Cash and Kris Kristofferson. As a listener, the jump from Seger and Browne wasn’t hard at all. The musicianship was different but the storytelling was similar. When I write, I float through those worlds. It’s about telling a story from beginning to middle to end. That’s where I landed as a songwriter. What’s your current gear set up? I use Wizard amps. They’re made by Rick St. Pierre, who’s a fantastic guitar tech out of Canada. I can’t recommend them enough. Onstage, I play a Fender Telecaster with a Hot Rails pickup. For most of the set I’m also on a Gibson Hummingbird or Dove. We recently finished the third season of Designated Survivor for Netflix. That will be out in May and we’re really excited about it. Do you ever foresee yourself focusing solely on music? A lot of people have asked me if I’d ever give up acting for music and I tell them I’ll be an actor until the day I die. It’s one of the great loves of my life. I just happen to have found another, and if I’m lucky enough I’ll be able to do both. 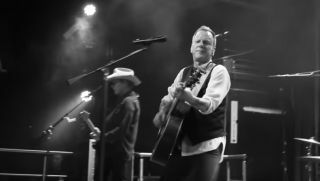 For more information, head over to KieferSutherland.net.